Since the Penguins began making cuts to their line up, one name has stuck out the most. Not because of what he is doing on the ice (which is fantastic) but because no one seems to know who he is. One by one, the members of the Baby Penguins participating in training camp made their way back home to Wilkes-Barre and only a select few remained behind. One of them is Carter Rowney. 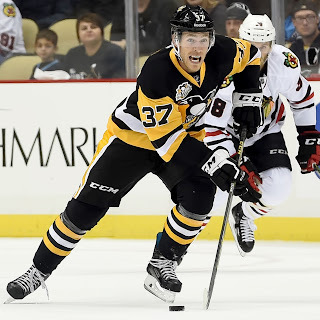 Rowney (27) has quietly made a name for himself within the Penguins organization. He is a solid two-way contributor, and though known to be a center, Rowney prides himself on his versatility to play anywhere on the ice. He is also a skilled winger when called upon to do so. Although he is not the fastest on the ice, this 6'2, 200-pound power forward is wedging his name into the mix of just who should start the season next week. Although likely to be sent back to join his brethren in WBS, Rowney is not making the decision easy for Penguin management. Rowney currently has 2 goals in the preseason while heavy favourite, Jake Guetzel, has yet to tally any points at all. Scott Wilson (who is under a one-way contract ) has 1 goals and 1 assist. A native of Grande Prairie, Alberta (Can. ), Rowney's journey to the NHL began at the University of North Dakota. While with the team from 2009-2013 he won 3 Western Collegiate Hockey Association championships and notched 10 goals in his senior year. Rowney was twice named to the WCHA All-Academic team as well. Though he was successful in his collegiate hockey career, he was undrafted and found himself without a place to call "home". After a tryout with the Calgary Flames fizzled and a 4-game stint with the Abbotsford Heat (AHL), Rowney came to the Penguins in 2013 and be-bopped between the AHL and ECHL for two seasons. A stint in Wheeling in his rookie season didn't showcase much. He came away with only 2 goals/ 2 assists in 24 games with the Nailers. Despite these numbers he was brought back up into the AHL in his second year as a pro and was set into the WBS penguins bottom six. The time has come for Rowney to make some noise and did he ever. The 2015-2016 season was a break out year for Rowney. On what went on to be one of the most prolific lines in the AHL (composed of Jake Guetzel, Rowney and team captain, Tom Kostopoulos), he scored 24 goals, racked up 32 assists for a total of 56 points in 74 games. He has a +/- of +22 which was the highest on the team and ranked 10th in the AHL overall. He was also second on the team in scoring. "I've kind of had a long road, a lot of paths, since I've been here but hard work has been paying off." Has it ever. In March, the Penguins announce that they had signed Rowney to a 2-year deal and a nice chunk of change right before getting married (he wed his long time girlfriend, Danielle Luetzen, this past August). The hard work has also landed him right in the middle of this season's starting line-up equation. Take a look at his goal from Wednesday nights preseason game against Detroit. The sky is the limit for this talented player with the heart of a champion and the grit to back it up. He isn't afraid to put in the hard work. Whatever decision is made by the coaches and management in the coming week, it is safe to say that Rowney is going to be remembered and will likely find himself in Pittsburgh sooner than later.